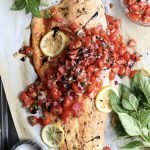 I’m so glad to be sharing this recipe for Bruschetta Salmon with you! Because if there’s one thing I love about summertime, it’s being in my garden. Of course, I definitely don’t love the bug bites or the sunburns, but that dirt.. well, it’s my therapy. There’s just something about it that puts my heart at ease. You know you just can’t beat the freshest produce from your very own backyard. The tomatoes, the peppers, the herbs! I can’t get enough. Cooking seasonally is really special. Because the ingredients are so fresh, meals can be really simple, but still unbelievably flavorful. In the summertime, we seem to always have an abundance of some seasonal produce, especially zucchini, cucumbers, and tomatoes (check out this summer Zucchini Caprese Salad!). When I was in the garden earlier today, I grabbed a few tomatoes and noticed our basil plants have been exploding, too! So when I picked up a salmon side from the market today, I just knew exactly what I’d be making- Bruschetta Salmon. Isn’t it fun when things just come together perfectly like that? I have to tell you, this recipe is really delicious. The sweet summer tomatoes, herby basil, and garlic are so nice with the fish. And it’s a deceivingly simple dinner – quick and easy enough for a weeknight, but so impressive looking and flavorful that you could make it for a dinner party (and all your friends will think you’re fancy!). 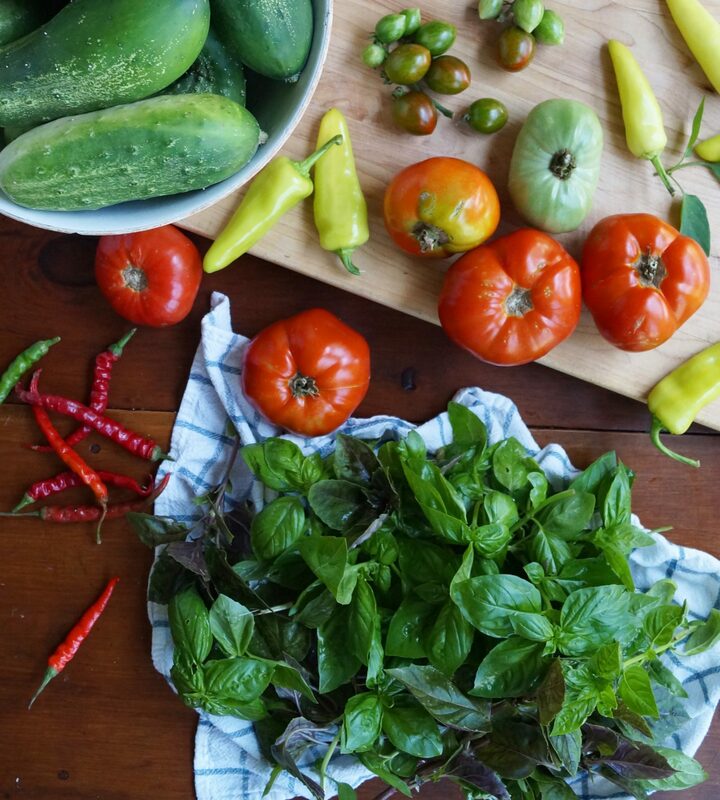 A typical summer garden haul: The freshest tomatoes, basil, peppers, and cucumbers. 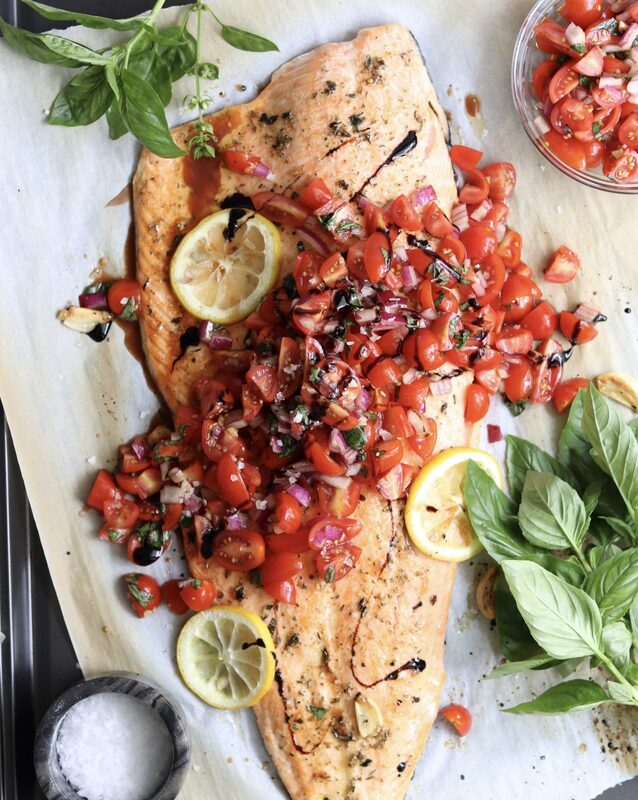 A simple and delicious salmon side cooked to perfection and topped with bruschetta, made with fresh summer tomatoes, herbs, and garlic. 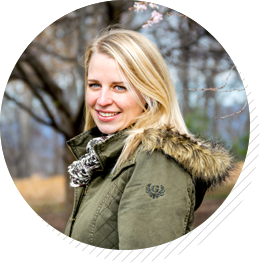 Whole30, Paleo, Gluten Free! Heat the oil over low heat in a small pan and add the garlic. Sauté until fragrant, about 3-4 minutes. Set it aside. Quarter the tomatoes and slice the basil chiffonade. Preheat your broiler. Mix all spices with the olive oil. Pat dry the salmon with paper towels and set it on a foil lined baking sheet. Rub the seasonings and oil all over the salmon. Cook under the broiler for about 3 minutes (this gently sears the flesh so you don’t get all that white albumin leaking out as it cooks). Remove it from the oven and turn the oven to 300 (your oven should be at temperature quickly since it’s already hot from the broiler). Lay the lemon slices on the fish, then return it to the oven and cook for another 8-10 minutes or until flakey and cooked through. *Note: This depends on the thickness of your fish and the power of your broiler, so watch carefully. I like my salmon a tad on the rare side, so I err on the side of less time. Have you made this Bruschetta Salmon recipe? I’d love to see! Tag me on Instagram @Cookathomemom or let me know in the comments below! Made it yesterday & loved it!! Yay, so happy to hear that!! My absolute favorite way to have salmon! Never disappoints. This dish is so mouthwateringly good!!! I tried your suggestion for finding fresh and sustainably sourced fish at Aldi’s and was not disappointed. Served my family of 6 perfectly and even had enough leftover to throw on top of a salad the next day! Thank you for your always so wonderful recipes Laura!